Before beginning any timber harvesting operation, the North Carolina Forest Service recommends developing a preharvest plan. This plan should include the locations of harvest activities, information about sensitive areas found on a tract, and practices needed to prevent or reduce impacts on the natural environment. Creating and implementing a preharvest plan can improve efficiency and communications, reduce risks to water quality, and increase landowner satisfaction. A preharvest plan can also help the logger save operating costs, such as wear and tear on equipment, and additional work or rework if found out of compliance with the FPGs. 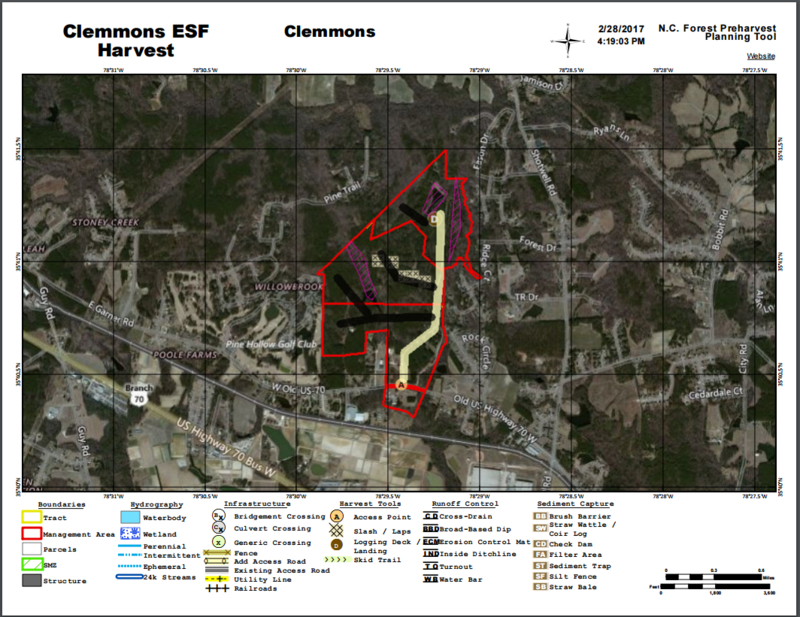 The North Carolina Forest Service has created the Forest Preharvest Planning Tool (FPPT) to assist loggers and forest landowners with preharvest planning. This online tool is a new way for forest operators and forest landowners to create customizable maps and receive site-specific reports, using current GIS data. The FPPT has an easy-to-use online interface and is free and publicly available. 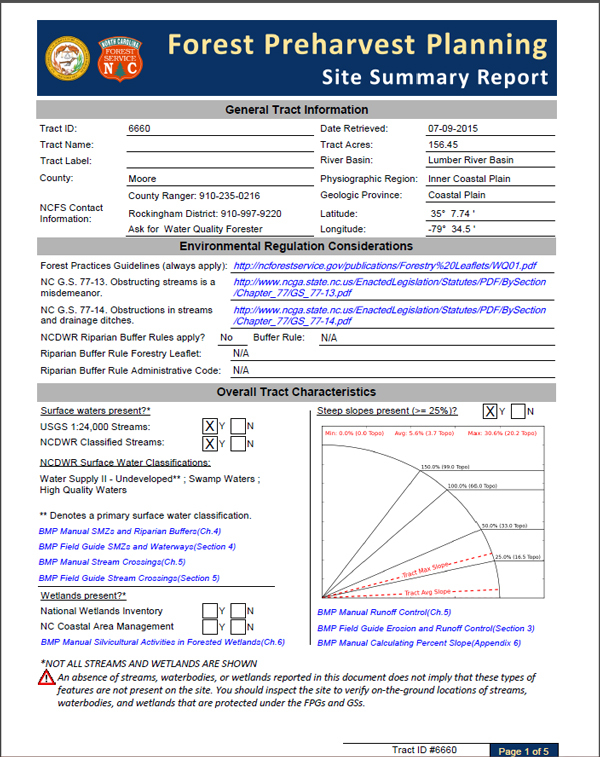 Users receive helpful and detailed products, including a site summary report and a soils summary report. The site summary report will give information on applicable regulations, tract size, and links to online BMP technical assistance. The soils summary report gives the user a soils map of their tract, as well as each soil’s suitability for a number of common harvest activities. The user can also create a tract map that shows the locations of harvest features such as skid trails, streamside management zones, and decks. The FPPT is a powerful information gathering and planning tool, but should still be supplemented with a pre-harvest site inspection by the forest operator prior to the forest management action. Applicable topographic and county soil maps will still need to be reviewed if the tract is found in a watershed subject to a riparian buffer rule. We believe this tool will save forestry interests both time and money by improving preharvest planning efficiency and communications. Check out our FREE Forest Preharvest Planning Tool here. If this is your first time using the FPPT, and you haven’t attended a training session, please take a minute to look through our quick-start user’s guide. Though the tool is built to be self-guiding, this tutorial link can help answer any questions you might have. If you still have questions, please contact Alan Coats at 919-857-4855 or alan.coats@ncagr.gov. Additionally, if you have a group of 25 or more people that would like an in-person demonstration of the tool, contact Alan Coats at 919-857-4855 or alan.coats@ncagr.gov to make arrangements. Forest Service staff can bring the demonstration hardware to your location and help your group get started with online preharvest planning.